YouTube is a vast repository of knowledge, from word pronunciations to history lessons to even primary historical sources from museums and government archives. But all you have to do is visit the site's notorious comments section to realize it can also be an awful place for anyone, especially children. How can you help kids navigate the pitfalls of YouTube to find the prizes? While some concerns are overblown, others are all too real. YouTube has been criticized, for example, for placing videos in a constant stream that can stray into bizarre areas if you let the videos run. There’s also problems with “trolling,” where people will insert disturbing imagery into children’s videos, and content that may not be explicitly violent or sexual but may still be inappropriate for kids to watch on their own. Kids researching the flu, for example, may come across footage of disease epidemics or surgical videos. There are two YouTube apps. The first app, simply called YouTube, offers access to the full content of the site. The second app, YouTube Kids, offers a more curated experience. Both offer on-site parental controls; YouTube will let you enable “Restricted Mode,” which will hide some objectionable content. However, this will need to be enabled on a per-account basis, and it’s only one filter run by the site. “Objectionable” is also something of a grey area; what YouTube considers unobjectionable may not meet your criteria, and you’ll only learn about it once the video pops up. YouTube Kids offers better controls. It lets you lock search, set a timer, turn off suggested videos to prevent the “YouTube rabbit hole” of users obsessively watching videos all day, and will let you block videos. However, the video is more aimed at younger children and may prevent searching for legitimate, if troubling, content such as war footage or speeches from historical villains kids may be asked to watch for homework. Parental control apps offer more specific controls over YouTube. You can block the app during certain times of the day, such as bedtime; you can limit what actions the app can take or block specific accounts or URLs; and you can even lock YouTube altogether. Just as important as software, however, is being there for kids when they’re watching any form of video. For example, many people will write off the old cartoons of the ’30s and ’40s as fine for children, but social attitudes have changed substantially in the intervening decades, and what was kid-friendly then may need some explaining from an adult now. Similarly, some legitimate uses of YouTube really will need a parent in the room. History is a good example. Kids will want to have somebody to talk to when they learn something unpleasant about the past. Even content presented in a child-sensitive manner is going to leave kids with questions. YouTube can be a useful resource and kids can learn a lot from it. But just like you wouldn’t hand kids the remote and tell them to watch whatever they wanted, it needs tight controls and parental supervision. We can help; to learn more, try Screen Time for free! Children should understand what screen time use is acceptable, and when it’s acceptable. For example, screen use might be ruled out in the mornings as everybody needs to focus on getting ready and out the door, and only certain uses may be allowed during the school day or during homework time. This serves both as a useful way to set ground rules about screen use in general, and get kids used to only having screens during certain times. Unstructured time can be where the real arguments begin. After all, if kids have nothing else to do, they may prefer to play games or chat with their friends. The best approach to this is to set rules for the entire family about when and where screens can be used. For example, you might set a rule that family members put away screens while the sun is up, and only use them during free time after dinner and before bed. Setting rules for everyone to follow is key because it allows you to model proper screen use. Everyone remembers a moment of an adult telling them to do as they say, not as they do, from their own childhood, and practicing what you preach goes a long way towards helping kids understand this isn’t just because you’re the boss. And when dealing with cheating the rules, parental control software can strictly enforce schedules. Another approach is to avoid the “digital babysitter” approach where possible. No parent should berate themselves simply because they absolutely had to get something done and the only option at that particular moment was the television. The trick is to make it more of a treat. Older kids, for example, might earn time playing video games by working ahead on their homework, by doing small chores around the house, or getting it as a present for good behavior or a holiday. The more you emphasize it’s an occasional distraction they’ve earned, not a right they can enjoy whenever they feel like it, the easier these discussions will be. Kids should also understand that “off” means “off.” If they don’t put the screen down right away, parental control apps like Screen Time have an “instant pause” feature that ensure they look up. Another simple way to put screens away is to ensure there’s plenty of other things to do. This can be family fun, such as outings, family walks, or book clubs. But it can also be classes, a library to read through, and other things. Making sure they have options beyond playing a game or watching a show will teach them they don’t need to look at their phones all the time. To learn more about Screen Time parental control software and how it can help, we invite you to try it for free. We all want the best for our kids, especially in a world that can seem unusually harsh and awful. But kids eventually become adults, and they need the tools to navigate the world, digital and real, by themselves. Here's how parents can help equip them with the skills they need. If you really want to watch every website your children visit, read their email and instant messages, and see every photo they share, you certainly can. But what, precisely, does that teach them? Shouldn’t they know that a stranger contacting them is bad on their own, without your intervening? Focus instead on a policy of supervision. Use website controls and parental control apps to set limits, and have a long talk where you explain in terms they can understand why certain websites and apps are off-limits. In short, invest them with trust and the ability to grow that trust. Parental control apps can make enforcing certain rules easy; no YouTube during homework or school, for example. But rules without justifications can be infuriating for adults, let alone children. So when you lay down a rule, include the reasons why with it. Make it clear that you trust them, but there are risks you want to keep them away from for now. Set standards and consequences for breaking the rules, and also standards for loosening the rules. For example, if they want their own Facebook account, you might ask them to demonstrate what they do if a stranger sends them a message that scares them, or that they’re able to spot propaganda and sort it from factual reporting. Similarly, remember that the challenges kids face can be very different. It would be wonderful if girls and boys were treated the same on the internet, but unfortunately, they’re not, and both boys and girls should know what to do when somebody is being attacked just for who they are. Make it clear the ultimate decision lies with you, and that any decision you make is conditional on following the rules. However, the rules should grow and change along with your kids. You should always leave the door open for them to talk to you about things that have happened to them and questions that they have. Even things that aren’t outright “wrong” by your family’s standards can be confusing or disturbing, and kids need to have a place to talk those issues out. This should also track the arc of school and their lives, and you may need to learn about, and process, that together. For example, if your children start learning about World War II in school, and they’re naturally curious, they may find some of the more troubling aspects of that war by themselves. It’s OK to tell your kids that the questions they have are hard to answer and may not even have any answers. Every family will approach the questions and concerns the internet raises in a different way. It’s less about universal rules and more about what your family can handle and what’s most important to them. 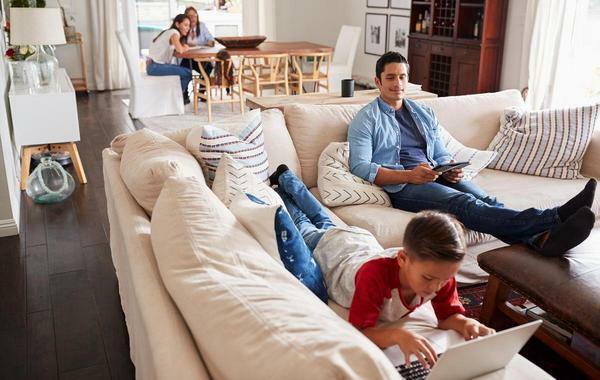 Open communication, honest interaction, and effective rules will be the best way for your kids to get the most out of the internet, while staying safe. Screen Time can help keep the rules in place. To learn more, try it for free! A map that constantly tracks exactly where you are can sound like the stuff of nightmares. And sometimes SnapMap, Snapchat's feature where it locates users on a map has been the subject of horrifying stalking stories, but it's also served the public good more than once. Here's what parents need to know about how it works, how to talk to their children about the risk, and whether teens should use it. SnapMap uses GPS and other location data to place “snaps” made by its users in certain locations and to tell friends where their friends list on the app is located when they have Snapchat open on their phones. On the web, this is presented as a clickable “heat map” that, when you tap on a “warm” area, brings up a snap that’s been contributed by a site’s user for that specific place at that specific time. The goal is to allow people to view events from multiple points of view as people collect photos, videos, and audio clips. On the app, your location is only visible to people you’ve friended, although users can also limit specific snaps to specific people, and can also configure a specific list to exclude certain friends or limit the data to specific friends. It also is only updated when you have Snapchat open and running on your phone. You can also configure it to “Ghost Mode,” which hides your location during certain times or unless you deactivate it, although if you submit a snap to the Our Story feed on the app, it will be tied to a general location. In keeping with Snapchat’s main feature, your location vanishes off of SnapMap after a few hours. Unfortunately, there’s no way to completely disable SnapMap once it’s been turned on, at the time of this writing. So if it’s been activated, you’re going to have to figure out how and where to control it, or you can simply remove Snapchat from your child’s phone altogether. How Can SnapMap Be Used Safely? First, parents and children need to sit down and have a conversation about balancing sharing with friends versus protecting their safety. Next, kids need to show parents who they have on their friends’ list. A key rule of internet safety is to only be friends with people you know in real life. That should be made even stricter with SnapMap, and remind kids that apps can’t figure out who’s controlling the phone. Just because it’s their friend on the map doesn’t mean it’s their friend watching them on the app. You should also have a discussion about whether you’re comfortable having your home tracked on Snapchat. External safety tools, like parental control apps, are equally important. You should configure controls to shut off Snapchat completely at certain times, such as at school. In some cases, it may be necessary to block Snapchat. And, of course, if your parental control app is in place, and your concern is too great to allow SnapMap to run, you can simply prevent Snapchat from being downloaded altogether. Social media presents unique challenges. Screen Time can help solve them. To learn how, sign up. First, it’s worth remembering the basic rules of Facebook. In jurisdictions without a specific law against children having social media profiles, Facebook only allows people 13 or older to have a profile; in some countries, that’s raised to the age of 14 or higher due to local statutes. Or, at least, this is the theory. The reality is that it’s fairly common for children with internet access to have Facebook profiles under their own name or someone else’s. While Facebook demands a “real name” and a legitimate email address as part of its terms & conditions, in practice this amounts to little more than having a valid email and a name on your profile that doesn’t sound fake. Nor does Facebook allow someone who doesn’t hold an account access to it, even if they’re a parent and the account holder is a child violating Facebook’s rules. Further, the tools that are available are limited to Facebook. Other sites it owns, such as Instagram, have separate rules and concerns. What Are Facebook’s Privacy Tools? First of all, it’s important to remember that kids can change these settings back. Before you work with Facebook’s privacy controls, you should have a discussion with your kids about why you’re asking for access to their account and making these configurations. When you’ve had that talk, start with the privacy checkup. Facebook will audit your profile and discuss potential privacy risks. This will allow you to set who sees your child’s profile, who can contact them, which apps can access their data, and who can friend your child on the platform. Limiting friend networks to “Friends of Friends” is particularly important, but stress to children they should only be friends with somebody they know in real life. Next, you should walk your kids through what to do to remove a bully. Facebook allows you to block anybody bothering you, and kids should be able to take swift action against them by excising them from their online presence. Finally, schedule a regular check-in, where your children give you access to their account and you can see what’s going on. Make a point of regularly talking to them about what they do online, and who they speak with. What’s being said to them? Who are their favorite social media personalities or YouTube stars? Having these conversations, and learning who these people are, is a key piece of protecting your children. The internet is still a work in progress when it comes to safety, social interaction, and children’s safety. Parents need to treat it accordingly, not just with Facebook parental controls, but also third-party parental control software and common-sense discussions with kids. If you need help keeping an eye on what your kids do online, sign up for Screen Time. Instagram is one of the most popular social media sites, especially among teens. But beyond the risks to public safety, it's also been shown to wear down the self-esteem of its users. The constant parade of people looking better, making more, spending more, traveling further can create a feeling of inadequacy or even failure. How can parents help teens form a healthier relationship with Instagram? Particularly when it comes to body image, which the majority of studies on Instagram focus upon, Instagram can be yet another venue for near-constant social pressure. After all, on TV, in ads, on movie screens, anywhere there’s an image, there’s usually a toned model or worse, a perfectly normal person presented as less than desirable. Have a heart-to-heart about social pressure and the roots behind it. One point your kids need to have reinforced is that in many cases, those “perfect” Instagrammers are trying to sell them something, and that they achieve their apparent “perfection” by using layers of filters, make-up, and special lighting to present a false image. Many famous Instagram personalities would likely be unrecognizable on the street, because their online image is so highly processed and curated. In some cases, just the act of using Instagram can affect your self-esteem. Studies have found that the constant, endless scroll of perfection can eat at your happiness, while simultaneously being addictive. Even if you only follow people you know, consider this: When you post about your family, do you ever include, say, a disappointing report card? If you’re talking about work, do you post a selfie with the boss who just told you to shape up or ship out? Probably not, because you don’t want to talk about it. But neither does anybody else, and over time, that reinforces the idea that you’re the only one without a perfect family, body, and job. Your children should understand that Instagram is designed to drip-feed them things they want to see, so that they’ll keep scrolling. Point out this behavior; for example, you might use parental control apps for cell phones to limit Instagram time to a certain number of minutes a day, and they can observe how they feel afterwards. It’s also worth looking at who your family is following on Instagram and ask whether they present a healthy worldview to anybody, teenager or not. Instagram is, to a strong degree, about wish fulfillment and longing. You can quite literally look, but never touch. This can be catered to in healthy ways, like food photography that includes a recipe and encouragement, or in negative ways, such as a photograph of an expensive dinner gloating about the cost. Look for the more toxic examples of Instagram posting and ask your teen to unfollow and even block them. Make it clear why you’re asking, and lay out what worries you about the feed. Parental control apps can’t do the parenting for you, but they can help reinforce the boundaries you set for your children. Finally, when they want to post on Instagram, or look for people to follow, look to real-life challenges and how they were overcome. Encourage your kids to learn a new skill, share a book they love, or something else that’s positive without being unreachable for others. A kind spirit does far more good in the world than a good selfie filter. Need help controlling your teen’s Instagram habit? We can help. Contact us to learn more about Screen Time. Impersonation used to be a difficult thing to pull off. Now, anybody with access to a social media site and an email account can pretend to be you, or, more often, your teen. If your teen finds somebody impersonating them online, here's what to do. There are two distinct issues here. Identity theft, as it’s commonly discussed, is stealing documents such as credit cards, Social Security numbers, and other identifiers used by stores and financial institutions and making transactions or decisions in your name. Impersonation is opening a profile in someone else’s name, usually taking pictures of them either from their social media profile or from public sources such as school websites, and pretending to be them on the internet. This distinction is important because identity theft is a crime, while impersonation may not be. There’s no specific law stating that it’s illegal to pretend to be someone else, fictional or real, on social media or elsewhere on the internet. It’s not even illegal to access someone else’s social media profile under certain circumstances, such as if you accidentally leave your social media profile open in a public place. This limits the options of law enforcement, although if the impersonation is used to commit another crime, such as fraud by soliciting donations, for example, they may have more latitude. Gather any information you can about the profile, including what email was used to register it. This is often visible in the main profile page or the “About Me” page. Screenshot the profile and any relevant comments or data. Keep the screenshots separate. Do not engage with the profile. Especially in the case of bullies, this will only fuel the flames. Discourage friends and family from engaging as well. Report the impersonation in the social media site’s “Help Center” or Customer Support page. This is a common problem on social media, and there will likely be a step-by-step procedure to report profiles considered “abusive” or “hostile.” You may also be able to chat with a customer representative directly. Block the profile from your personal accounts and make sure your family does the same. If you haven’t already, limit access to both your and your children’s profiles. If possible, track where they got data, such as personal photos, and remove or protect it from being downloaded. Once this is addressed, sit down with your child and help them process their emotions. Impersonation happens for a number of reasons, but the most common is pranking or bullying. More likely than not the impersonator is somebody your child knows. Do not press them or demand they tell you anything. Let them discuss the issue at their own pace. Social media has enabled some wonderful things, but it can also open the door to the strange and devious side of human nature. Working with your children to understand and prevent that will help them get through these issues. To learn more about cyberbullying and how parental control apps like Screen Time can help, try it for free. Much of our society is “set it and forget it.” Our appliances turn on and off automatically, our bills are set to autopay, our cars can park themselves, and that makes it easy to forget that some of what we do must be hands-on. And while parental control apps can help with monitoring kids' internet use, they're only one piece of the equation. Any parent knows kids follow their lead, for good and for bad. Kids will, consciously or not, imitate their parents as a fallback for every kind of situation, from dealing with confrontation to picking what they eat for lunch. Furthermore, parents set and enforce the rules from which kids learn. Of course, this doesn’t mean kids are clones of us. Kids will push back against rules they think are arbitrary and can choose whether their parents are a positive example or a negative one. Yet we can mistakenly write off the influence we have on our own children. For example, you can set your parental control app to the strictest possible standards. But if your children don’t understand your concerns, or have friends pushing them in the opposite direction, ultimately it won’t affect their behavior. This is especially true in “do as I say, not as I do” situations. If your teens can’t look at their phones, for example, but see you constantly being tugged by notifications and alerts, they’ll wonder why you’re not taking a dose of your own medicine. So, how do you fill in the other part of the equation? How do you parent so that internet controls work as you intend them to? Begin with a long conversation. Explain why you have certain rules, and make it clear that the rules can change over time. Today’s tween is tomorrow’s teen, and they’ll have different needs for their phones. Lay out what behavior you support, like researching homework or reading a book on a phone screen during a trip, and which you don’t, like spending excessive time on a manipulative game or focusing on friends instead of homework or chores. Everyone in the family should know they can come to you to talk about their phones. Be sure to make clear your concerns, like too many notifications distracting from chores or too much time spent on games. Keep the conversation going as well. Ask your family what they’re using their phones for. If they’ve found a new app or website, ask them about what it does. If they have a new friend, learn what you can about them. Let your kids know they can come talk to you about anything they see on the internet and how it makes them feel. If the rules get broken, or if there’s an attempt to break them, go over why the rule is in place and enforce a fair, reasonable consequence that helps kids understand your concern. Every family will be different in their approach. Some will allow personal time on screens at different times and in different places. What should stay consistent is how engaged you are as a parent. If kids understand that you care, and the reasons behind the rules, they’ll grow up to be responsible phone users themselves. Need help enforcing the rules? Learn more about Screen Time.